Glens Falls NY - See What's Happening Downtown! 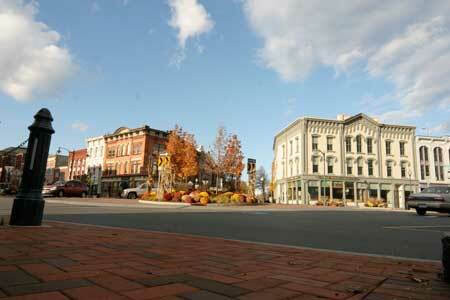 The fall has been a busy time for downtown Glens Falls. Established businesses are expanding, new businesses are opening, and empty buildings are being leased to breathe new life into Hometown, USA's hub. Gourmet Cafe recently expanded, moving the front of the restaurant closer to Glen Street. The additional space will allowing for more seating, which will be especially helpful on Thursdays, Fridays and Saturdays when the crowds flock to the cafe for its very popular "Pasta Night." Around the corner on South Street in the Empire Theatre building, North Country Coffee Cafe recently opened its doors. Serving coffee, bagels, baked goods, soups, salads and wraps, the cafe has found great success since the opening. Adding to the excitement downtown is Orange Cat Cafe, a business that owner Tamara Stevens has relocated back to her native Glens Falls from Rhode Island. Both breakfast and lunch will be served at the cafe, in addition to specialized baked goods. This business will occupy the building where the Boston Candy Kitchen previously resided. A joint venture for Trampoline Design and Davidson Brothers, Nine: Authentic Goods officially opened its doors on December 10th. The retail store will celebrate Glens Falls and the Adirondacks, though clothing, jewelry, posters and paper goods, and specialty goods. Trampoline Design will also be relocating their office to the upstairs space in the new building, at 166 Glen Street. An upcoming ribbon cutting ceremony and party will officially recognize the opening and relocation of three businesses in the Colvin Building. Bay Street Beadworks and Adirondack Wedding Association have leased space at 206 Glen Street, which will also be the new headquarters for Total Entertainment. The downstairs will house Bay Street Beadworks, and Adirondack Wedding Center and Total Entertainment will be upstairs. The ribbon cutting ceremony will be on Friday, December 17th at 4:00 p.m., with the party immediately following from 4:30-7:00 p.m. The event will also be the grand opening and open house for all three businesses and visitors can tour Adirondack Wedding Center and obtain information about memberships, as well as shop Bay Street Beadworks. Dunham's Bay Resort and Sweet Basil Restaurant will provide food for the occasion and visitors can also enjoy a cash bar, chocolate fountains, cupcakes, music and more. There's something for everyone now in the new and exciting downtown Glens Falls. Head down to grab a coffee, eat at a new cafe, celebrate new store openings and finish your Christmas shopping!